Sanitarium – Bringing you the best in horror, one case at a time. 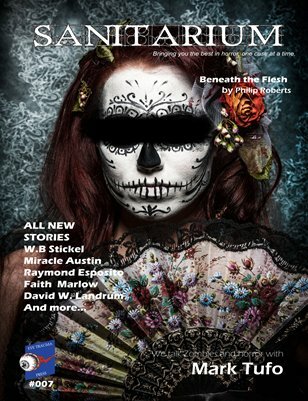 Published monthly, Sanitarium showcases stories from both up and coming writers and seasoned pros. We welcome you to the Sanitarium, committed to bringing you the best in horror! We spend a moment with Mark Tufoan talking zombies and all things horror and we see “Where the Horror Happens” with Richard Thomas. We also introduce a brand new feature, the "news" where we will cover up and coming anthologies and collections awaiting your submissions.